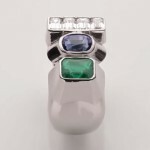 An extremely powerful Trilogy Ring with a very fine combination of a fine Em Cut Blue Sapphire, Fine Emerald & very fine Em cut Diamond set in platinum. This ring helps the wearer in context of presentation, arts, craft, wisdom, common sense, diplomacy, leadership, desires, status, prestige, business travelling and strength. It is especially suitable for natives who are logicians, IT consultants, Stock brokers, Financial consultants, Accountants, Legal consultants, Sales directors, crafts men, designers, engineers, Technology developers, Surgeons, Plastic Surgeons, Psychics, Tantric practitioners, Strategy masters, bankers, dealers and lovers of luxurious lifestyles. Astrologically this ring is very effective for natives with lagana’s of Taurus, Libra, Capricorn & Aquarius.